Full name is Meibrys John Viloria (May-breez)…resides in Cartagena, Colombia. Spent majority of the season with Wilmington (A+), where he hit .260/.342/.360 (93-for-358) with 23 extrabase hits and 44 RBI in 100 games... Recalled Sept. 1, becoming the sixth known Royal to make the jump from A-ball to the Majors (not including Rule 5 picks), according to Royals Hall of Fame Director, Curt Nelson, joining: Donnie Murphy (2004), Dee Brown (1999), Mike Sweeney (1995), Jeff Granger (1993) and Buck Martinez (1969)...Became the first Colombian-born player in Royals history and the fourth Colombian-born catcher in Major League history... Made his Major League debut on Sept. 2 vs. Baltimore and recorded his first career hit, a two-run double in the eighth inning...Set a career high with three hits on Sept. 29 vs. Cleveland, two of which came off Corey Kluber...In his seven starts behind the plate, Royals starters posted a 1.84 ERA (9 ER in 44 IP)...Played in a Carolina League-high 88 games at catcher, and led catchers in assists (86) and double plays (9, tied)...Threw out 38 of 92 would-be base stealers (41.3%), the second-highest rate among league qualifying catchers. Spent the entire year with Lexington (A), playing in a career-high 101 games ... Ranked second among South Atlantic League catchers in doubles (25) and RBI (52)…also led the league's catchers in runners caught stealing (45) and percentage (.398) ... Tabbed SAL Player of the Week on May 7, going 9-for-19 (.474) with three doubles, two homers, five RBI and five walks during the previous week ... After struggling in the first half, batted .287/.333/.425 (48- for-167) after the All-Star break, including .312 (24-for-77) with six doubles, two homers and 15 RBI from Aug. 1 to the end of the season (22 games) ... Collected season highs in hits (4) and RBI (4) on Aug. 18 in a win over Asheville ... Named the Royals' 17th-best prospect by MLB.com, following the season. Named Idaho Falls (Rookie) Player of the Year and Pioneer League Most Valuable Player in 2016…led league in batting average (.376), doubles (28) and RBI (55) ... Tabbed a Pioneer League midseason and postseason All-Star, MiLB.com Organization All-Star and Baseball America Rookie All-Star in 2016 ... Led all Royals' minor league players in batting average in 2016…also led the Pioneer League, throwing out 33 wouldbe basestealers ... Enjoyed a Pioneer League-best 20-game hitting streak (July 7-Aug. 7, 2016), earning MiLB.com Player of the Month honors in the league for July. Named Dominican Royals Player of the Year in 2014, hitting .306 (34-for-111) with eight doubles, a triple, two homers and 20 RBI in 33 games. April 4, 2019 C Meibrys Viloria assigned to Northwest Arkansas Naturals from Omaha Storm Chasers. March 25, 2019 C Meibrys Viloria assigned to Omaha Storm Chasers from Northwest Arkansas Naturals. 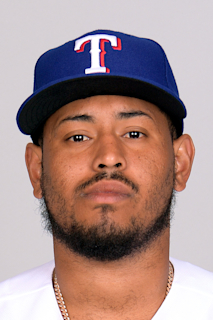 March 22, 2019 Kansas City Royals optioned C Meibrys Viloria to Northwest Arkansas Naturals. September 1, 2018 Kansas City Royals recalled C Meibrys Viloria from Wilmington Blue Rocks. March 13, 2018 Kansas City Royals optioned C Meibrys Viloria to Wilmington Blue Rocks. November 20, 2017 Kansas City Royals selected the contract of Meibrys Viloria from Lexington Legends. April 3, 2017 C Meibrys Viloria assigned to Lexington Legends from Idaho Falls Chukars. March 4, 2017 C Meibrys Viloria assigned to Kansas City Royals. June 11, 2016 C Meibrys Viloria assigned to Idaho Falls Chukars from Burlington Royals. April 6, 2015 C Meibrys Viloria assigned to Burlington Royals from DSL Royals. July 7, 2014 C Meibrys Viloria assigned to DSL Royals from Burlington Royals. May 30, 2014 C Meibrys Viloria assigned to Burlington Royals from DSL Royals. February 26, 2014 C Meibrys Viloria assigned to DSL Royals. July 2, 2013 Kansas City Royals signed free agent C Meibrys Viloria to a minor league contract.